The Navy is clamping down on noisy exercises to protect an endangered whale species. © Boston Globe - Getty Images The Navy is clamping down on noisy exercises to protect an endangered whale species. The Navy has agreed to restrict noisy training activities in certain parts of the Atlantic Ocean in order to help save the North Atlantic right whale. The whale species, whose total population is pegged at less than 500, is critically endangered and experts warn it could reach extinction by 2040. The Navy will now curtail some of its activity in the region over fears that it could be contributing to the species' demise. Navy Times reports that the U.S. Navy will limit the use of active sonar and explosions along certain portions of the Eastern Seaboard from Mid-November. According to theVirginian-Pilot, most of the restricted area is within 50 miles of the coastline, although it also extends to 100 miles off the coast of Florida. Another activity the Navy has agreed to restrict is shock testing, in which several tons of explosives are detonated underwater near a new warship to test its durability in wartime. 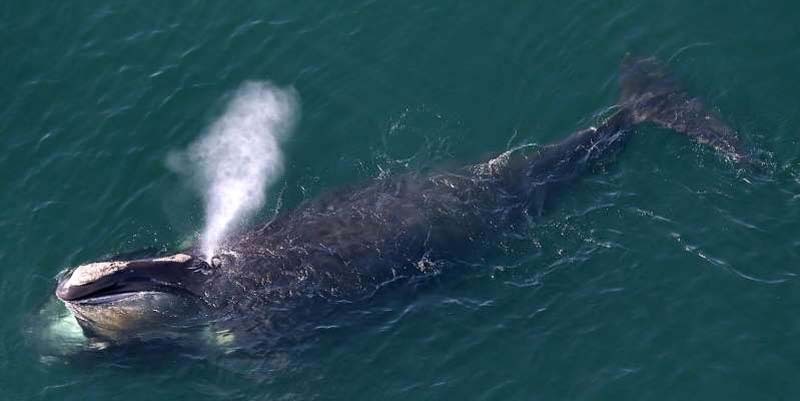 Shock tests frequently take place off the coast of Florida, and the Navy has agreed not to shock test near its Jacksonville operating area between November 15th and April 15th-the season when North Atlantic right whales are born. The North Atlantic right whale is a baleen whale that uses a filter feeder system to consume krill. Right whales were nearly hunted to extinction by whalers in the 19th century, and the population has not rebounded like many other whale species. There are an estimated 430 North Atlantic right whales, with just 100 females capable of reproduction. They are known as “urban whales,” because they tend to stick close to the shoreline-a tendency that makes them vulnerable to collisions with ships. The U.S. Navy at times generates quite a bit of underwater noise in activities ranging from anti-submarine warfare to ship testing. One major culprit in harming whales, according to environmental activists, is active sonar. Active sonar broadcasts sound waves through the ocean that reflects off underwater objects, ideally detecting enemy submarines. These sonar noises can burst up to 235 decibels, and are thought to cause considerable harm to whales, including driving them to self-injury and death. As part of the Navy’s efforts, warships will broadcast messages to commercial ships with the location of whale sightings. The new restrictions on training come as the U.S. Navy is beginning to take anti-submarine warfare seriously again. The rise of the Chinese Navy and Russian cruise missile submarine threats is reorienting the Navy back to detecting, tracking, and destroying enemy subs. The threat of Russian cruise missile submarines such as the Borei-class subs is deemed important enough that the Navy recently reactivated its Cold War-era 2nd Fleet to deal with the problem.